In April 2015, this message headlined a story published by Zvezda, the official outlet of Russia’s Ministry of Defence, like reported by euvsdisinfo.eu. Zvezda’s publication was not an isolated event. 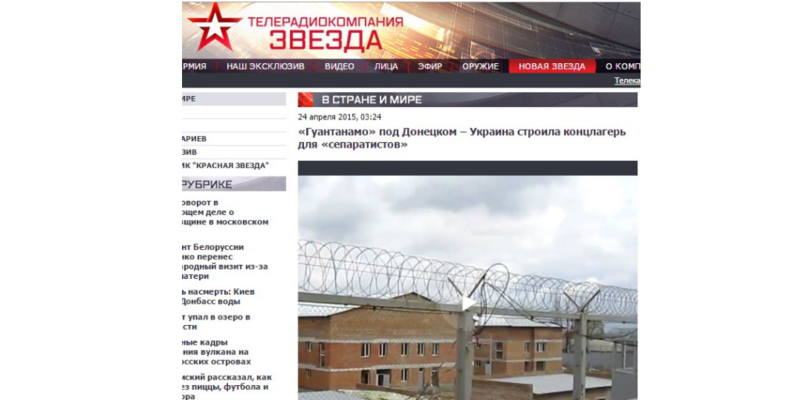 In a matter of one week in 2015, different Russian media outlets spread the same sensational message about the existence of EU-financed “concentration camps” in Ukraine. Now, four years later, the case remains a textbook example of how a proactive disinformation campaign works. In some situations, pro-Kremlin disinformation is reactive. Reactive disinformation is used when the Russian side has a particularly bad case and often when Moscow is accused of violating international norms. This makes reactive disinformation fundamentally defensive. It floods the information space with different, even conflicting answers to the question what has really happened; or it tries to dismiss the accusations against the Kremlin with ridicule. A well-known example of reactive disinformation was the Kremlin’s campaign to sow confusion about the real identity of the “little green men” who occupied Crimea in 2014. Moscow’s still ongoing campaign to cover the truth about the downing of Malaysian Airways Flight MH17 in 2014 is also reactive; the same can be said of the campaign to distract attention from Russia’s responsibility in the military grade nerve agent attack in Salisbury, UK, in March 2018. Contrary to the flat denials of facts and free imagination characterising reactive disinformation, proactive disinformation tries to base its message on an element of truth. The facilities shown by Zvezda and other pro-Kremlin media actually existed; and they were in fact EU-financed. But it was not a concentration camp and it was not meant for detention of separatist fighters. In this and other cases of proactive disinformation, the problem is the framing, i.e. the use of the manipulative phrase “concentration camp” to create a politically and emotionally highly charged narrative. So what are the strengths and the weaknesses of these two different disinformation methods? The strength of reactive disinformation lies in its instrumentalisation of the democratic principle that different opinions should be heard. By presenting its smokescreens as if there were relevant alternative viewpoints, reactive disinformation appeals to our instinct of fairness: it hopes that audiences will accept at least some degree of compromise, based on the false equivalence between the facts and the disinformation. The weakness of reactive disinformation is that once its claims have been picked apart by fact-checking and investigative journalists, it loses its power – and the masterminds behind the disinformation are exposed as not trustworthy. In other words, reactive disinformation can only buy time. Proactive disinformation has its strength in it that it focuses on one narrative and keeps on repeating just that one narrative until it gains traction. By applying an element of truth, it also makes the work of fact-checkers, and thereby the exposure of the disinformation, more difficult. The disinforming actor can choose to focus exclusively on issues of sensitivity for its counterpart – in the case of the concentration camp narrative, the disinformation touches on migration and the relationship between the EU and Ukraine. Does proactive disinformation have any weaknesses? The question that remains is what risks proactive disinformation campaigns take, if any. If audiences which are not the primary target group of a proactive disinformation campaign are exposed to the manipulative framing, it makes the disinforming actor look problematic. For example, it will probably be clear to those who are normally not under the influence of pro-Kremlin disinformation that the concentration camp narrative is a way of making Ukraine an acceptable target of the Kremlin’s aggression by associating the authorities in Kyiv with Nazism. Finally, general critical awareness about the disinforming and propagandistic sources and the policies they serve can also develop inside the community which is the primary target of the disinformation, in this case Russian domestic audiences. And Russian journalists have increasingly been in the forefront of challenging reactive as well as proactive disinformation. When awareness in these audiences is raised to a certain level, they will begin to ask if it is worth the while to trust what they hear. And voices among Russian commentators have recently begun to suggest that Russia has in fact lost more than it has won with its disinformation campaigns.